Just one year ago, Edith Liu knew little about robots and was planning on following her classmates to work at a Fortune 500 company after graduation. Today, she is the co-founder of a startup that is bringing a French robot to China to help rehabilitate children with autism spectrum disorders (ASD). What a difference a year makes. Liu's company--Open Source Maker Space--launched the robotic project, called A Machine's Soul on crowdfunding platform Themakers.cn in September. By the November 8 closing date, the company received 858 likes on the site and raised 135,210 yuan ($21,290), surpassing their target amount of 120,000 yuan ($18,900). The humanoid robot, NAO, stands at 58 cm tall and has mood recognition and interactivity capabilities, such as walking and talking. The robot is programmed to communicate with children with ASD in voices the children are familiar with, such as their parents or pediatricians. The kids can also acquire and practice life skills with the robot through an interactive imitation game called Follow Me. The original developers--Paris-headquartered Aldebaran Robotics--have an open source policy that allows other entrepreneurs to create their own applications for the robot. The robot is being used in computer and science classes in over 70 countries, according to Aldebaran Robotics. Liu, 25, graduated from Audencia Nante in France with an MBA and toured Aldebaran headquarters in November 2014. Her future business partner, 33-year-old Nicolas Xie, a telecommunication graduated interested in robotics, arranged the tour. Liu knew next to nothing about robots, but the machine's human-like capabilities piqued her interest. "I was totally fascinated by how intelligent NAO was. It was the first time I found that a robot isn't just a cold machine and it's not that far removed from my life. It was friendly and approachable and can be a good companion," Liu told Beijing Review. "We made up our minds to introduce NAO to Chinese children with ASD, because we would like to offer a new approach--a hi-tech one--to autism treatment back home," Xie said. ASD is a group of neurodevelopment disorders with repetitive patterns of behavior, sensory issues, difficulties with communicating or social interactions and cognitive delays, in some cases. Specific disorders include Asperger syndrome and autism. According to a 2013 World Health Organization report, one child in about 160 has an ASD and subsequent disability in the world. In China, there are about 1.64 million children are diagnosed with ASD. In December 2014, Liu and Louis Lu, 30, a former engineer at ZTE's European branch, established Open Source Maker Space in Shenzhen, south China's Guangdong Province. Liu and her team spent six months consulting experts, conducting field surveys and research and designing solutions. They created a tailored application platform for teaching and learning based on NAO's hardware, making a one-on-one or group interaction between children with ASD and the robot a reality. Their key innovation, according to Liu, is a platform that comes with a remote control that allows pediatricians and parents to control the NAO without any programming knowledge. "The ongoing assessment demonstrates that most of the children with ASD have a positive response to the robotic assisted rehabilitation," Xie told Beijing Review . The company began collaborating with the Golden Age Interventions Center for Special Children in May 2015. Launched in 2004, the center is among the first non-governmental rehabilitation institutions for autism in Shenzhen. 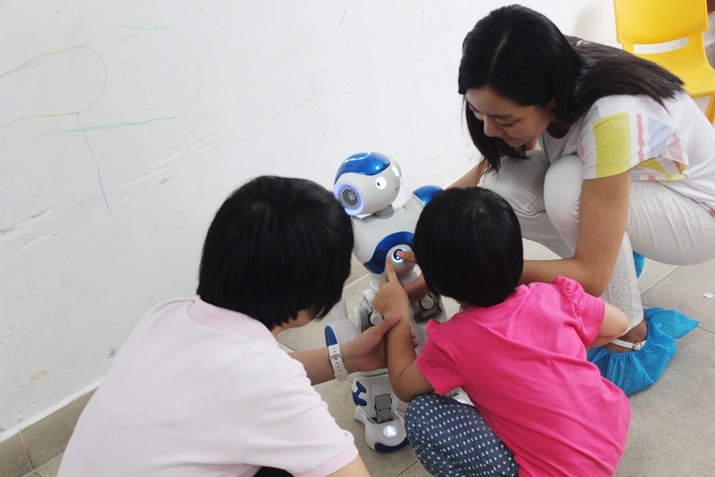 "The children here are curious about the robot, which encourages their desire to communicate," said Wang Jing, a social worker at the center. It appears to be working. Some children recognized Liu after she repeatedly visited the center for assessment sessions. "I was impressed the other day when four-year-old Fei Fei (pseudonym) hugged me and sat on my lap right away. Another seven-year-old boy said 'robot' when holding out my arms. His pronunciation was unintelligible, but I was deeply moved," Liu noted. After almost a year in operation, Liu and Xie say the next step is determining how they should evaluate treatment outcomes. Does the combination of artificial intelligence, medical theories and real life applications meet the expectations? One issue the team has encountered is that the human-robot interaction is interrupted if the child pushes NAO or fiddles with it. They're developing a bigger and heavier robot to counteract the problem. "We need to spend more time on assessing if treatment has improved," Xie said. The Machine's Soul project goes behind helping individual patients, though. Lu said it has helped raise awareness for ASD. "Currently, there are fewer than 3,000 professionals in rehabilitation training for autism nationwide. The involvement of robots will definitely lend them a helping hand," he said. The company has promised to use all the money raised during the crowdfunding to improving the existing application platform. Beginning in January 2016, they will collaborate with an autism treatment center and choose five families to design a customized teaching content for their children with ASD. "Now, more people know about our project. Several ASD-affected families contacted us. We have recognition and support from the government," said Liu. "What we have is far beyond my expectations."